No. 591 once perfectly matched its neighbor to the right. The storefronts remain idential. 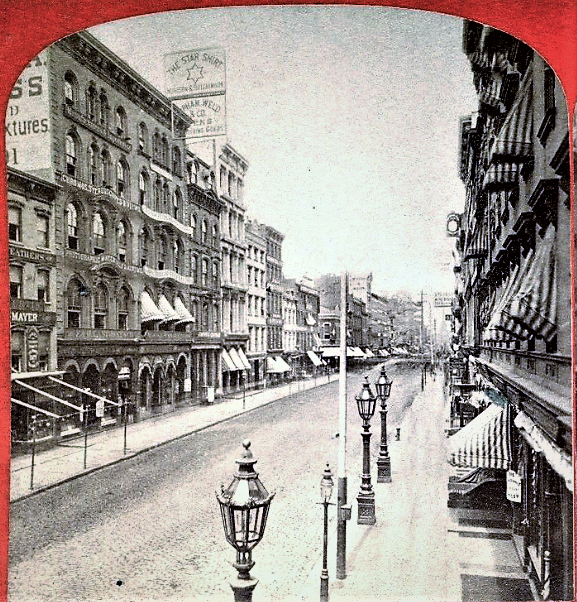 Just prior to the Civil War commercial buildings began replacing the staid old homes of Broadway below Houston Street. In 1860 the two matching white marble structures at Nos. 591 and 593 Broadway were completed. With modified Italian Renaissance touches like robust arched pediments over the central windows of the second and third floors they rose five stories to a shared, bracketed cornice. Stone quoins ran down the sides of the buildings. Merchant tailors Alonzo R. and William H. Peck established their business in No. 591. 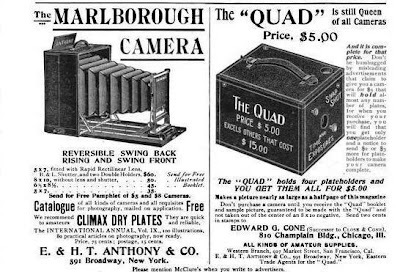 While the brothers sold apparel to its well-heeled clients, two other brothers, Henry and Edward Anthony, were establishing themselves elsewhere as leaders in a new technology: photography. Although both of the Anthony brothers had been educated at Columbia College as engineers, neither was satisfied with his profession. Both men worked on the Croton Aqueduct—the engineering marvel that brought fresh drinking water to Manhattan. Before the completion of the project James Renwick called upon Edward to assist him in a survey of the northeastern boundary of the United States. There was, at the time, a dispute between Great Britain and the U.S. regarding the Canadian border. Edward Anthony had been for sometime fascinated with the “new art of making pictures with the aid of sunlight, just introduced by Daguerre,” as explained in “America’s Successful Men of Affairs” later, in 1895. During the survey Anthony took photographs of the terrain, documenting hills along the boundary line that England denied existed. The resulting proof ended the controversy and was the first example of photography being used to settle diplomatic disputes. Edward’s firm, which now became E. & H. T. Anthony & Co., had already become the largest manufacturer of photographic materials in the world. By 1870 the company took over the entire building at No. 591 Broadway and operated a chemical works in Jersey City, and had three factories for the manufacture of cameras and other apparatus in Brooklyn, Hoboken and New York. In addition, the firm published periodicals such as Anthony’s Photographic Bulletin. On a Wednesday afternoon in October 1884, Henry T. Anthony left No. 591 Broadway heading to his home at No. 108 Lexington Avenue. He decided to make a quick stop at 17th Street and 4th Avenue and, while crossing the street, had to bolt out of the way of an oncoming horse car. The 70-year old bachelor took a hard fall onto the pavement and was seriously injured. The doctors at New York Hospital had him taken to his residence as “it was known that his injuries were fatal,” said The American Bookseller the next week. With his death, Edward was once again the sole principal. It was a time when photography was for professionals only. Not only were the supplies expensive, but the equipment was ungainly and the process complicated. That was soon to change. On August 18, 1885 The New York Times reported on revolutionary developments. Along with its cameras, the firm sold everything related to the field: portable dark rooms, photographic films, sensitized papers and “amateur photographic outfits,” among them. On December 14, 1888 Edward Anthony died. His son, Richard A became secretary of the firm which continued under the presidency of Vincent M. Wilcox. After three decades in the building, on December 15, 1899 E. & H. T. Anthony advertised its “removal sale” in the New York Tribune. Although the firm would continue to do limited business here until around 1904, the bulk of the building was taken over by The Strobel & Wilken Co., importers and dealers in toys. In March 1900 No. 591 Broadway was sold at auction to William Cohen, of Cohen, Endel & Co., for a bid of $157,500. Three months later the new owners announced their intentions to “make elaborate alterations to the building, including an additional story,” as reported in The New York Times. The report was not exaggerated. All traces of the old marble building above the ground floor—which had been modernized along with its neighbor around 1895—were wiped away and a fantastical, updated façade installed. Slender cast iron piers rose through the four central floors affording extensive expanses of glass. The new sixth floor which sat above a decorated cast iron entablature was frosted with terra cotta ornamentation. Above the rows of arched windows rose a brick pediment covered in terra cotta. The toy dealer would remain here for fifteen years, followed by apparel firms as the dry goods and millinery industry firmly implanted itself in the neighborhood. In 1916 Nelson, Siegel and Company was here manufacturing ladies’ hats. By 1920 shirt manufacturers Nibenberg & Saltzman had its offices here. The sizable firm turned out about 1,500 dozen shirts every week from its factory in Johnston, New York. At the same time Kalter-Cerf Mercantile Company operated from the building. The diverse company dealt in shoes as well as operating as jobbers and wholesale auctioneers. Today the handsome building is little changed. As is the case with its former twin next door, the late Victorian storefront at street level is miraculously intact. Art galleries replace shirt manufacturers and a Victoria’s Secret retail store occupies the ground floor where cameras and toys were sold. And passersby would never guess that the building once matched its more pious neighbor before a unique, near-whimsical remodeling of 1900. Excellent information on E. & H. T. Anthony’s building. Is there a way I could send you a scan a stereo card of it that was sold by E. & H. T. Anthony. I would love to see it. You can send to the email address in the upper left hand portion of this page.